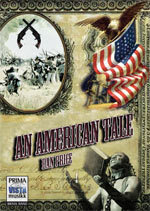 An American Tale - is a musical tribute to the American Civil war. The medley includes, The Battle Hymn of the Republic, The Girl I Left Behind, Kingdom Come, Yankee Doodle Dandy, The Soldiers Return, Turkey in the Straw and concludes with Amazing Grace, a song synonymous with slavery and selected to conclude the medley as a reflection of the war’s primary goal. Each of the songs is scored in a psuedo-compositional style of an American composer including; John Philip Sousa, Aaron Copland, Charles Ives and Leonard Bernstein.